Yesterday’s post about how difficult it is to get a building permit for even a neon sign sparked some interesting Facebook discussions. Clearly getting any sort of building permit is not an easy task in the Czech Republic. Our own experience at AVAST shows that getting a permit for a small sign can easily take 3 months. But, we should not be unthankful. At least at AVAST, we did GET the permit. I mentioned AVG in my blog yesterday as the other well-known antivirus brand from the Czech Republic. In case you don’t remember, some time ago AVG was actually called Grisoft after its founder Mr. Jan Gritzbach – GRItzbach SOFTware. 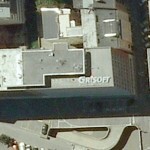 And the Grisoft company was located here: 49°12'9.262"N, 16°36'23.723"E (view the satellite image).